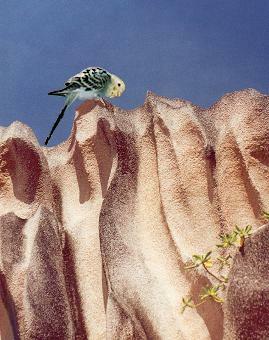 Even budgies occasionally love to go on holiday. My birds therefore flocked together and co-ordinated on where their first works outing should lead them to. Since they had saved a lot of money - they do not have to pay a rent for their accommodation in the bird room and also their food is for free -, their piggy bank was pretty full. 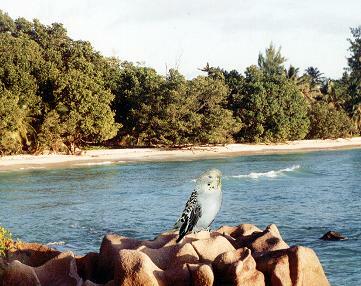 Together with Nellie, the mascot of Birds Online, the feathered friends wanted to do a real big thing, so they traveled the Seychelles. 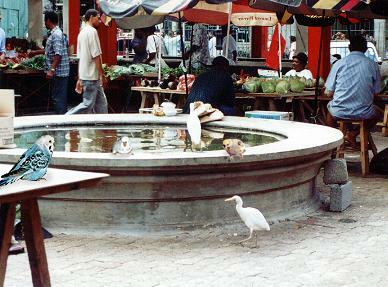 Shortly after their arrival, the birds went to the capital Victoria and its market place. Larissa, the white budgie, and Rana perched on the fountain and observed a heron marching around. The shy, sky blue Ares watched the scene from a safe place. From Mahé they headed to another island called Praslin. 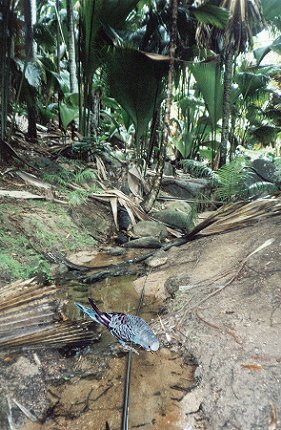 There the birds visited the gorgeous sanctuary "Vallée de Mai", in which the amazing Coco de Mer can be found. Kiki was thirsty, so he drank from a crystal clear brook. On the protected area Bird Island which was the next place they went to, my budgies and Nellie met lots of other tourists. Tethys (left), Jupiter (middle) and Io joined a group of Ruddy Turnstones on the beach for talking to them. Dione found it boring to do small talk quite soon. 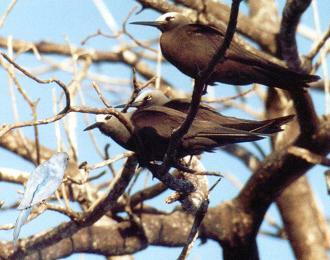 She preferred to listen to the exciting discussions of the Common Noddies, who gathered after they have hunted for fish. 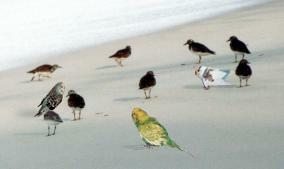 The sky blue budgie hen was fascinated about it, so she approached the huge sea birds carefully. 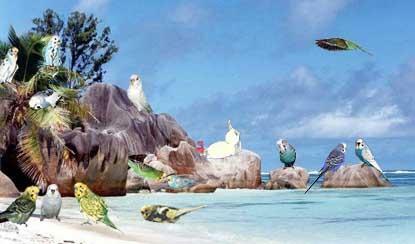 On the small, idyllic island called La Digue, Umbriel was more than fascinated by the red granite rocks. From the cliff top, he looked over the beach where his friends were hanging around. Tethys loved to take a sun bathe on a small rock in the northern part of a pictorial bay called Anse Sévère. At the end, they all agreed with this: The most beautiful beach of the Seychelles islands they have visited was the fabulous Anse Source d'Argent on La Digue. In the turquoise and light blue, warm water of the Indian ocean and on the fine white sands, they spend a lot of time just liming and having fun.